A single-family home with a double-car garage was often viewed as the definition of how wealth was measured in a growing urban community like Toronto. However, through generations, societal philosophies are shifting away from a focus on financial wellbeing and towards a broader lens that includes physical wellbeing and health. 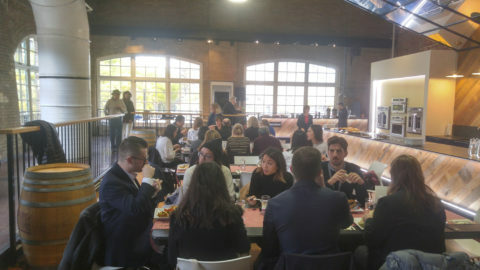 “The New Wealth is Health: Realigning our Cities” ULI 2018 Symposium tour explored how various communities within Toronto have transformed through health and wellbeing. Originally built in the late 1940s, Regent Park, the tour’s first stop, had gained a reputation of being one of Toronto’s poorer and more dangerous neighbourhoods. 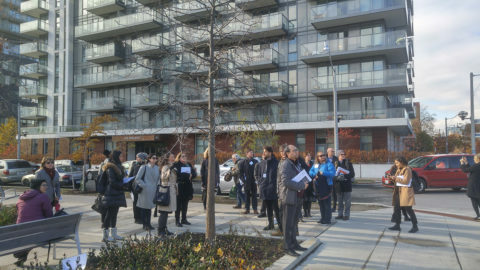 Revitalization initiatives since 2005 transformed Regent Park from being solely a social housing development to also include a community that promotes positive socio-economic movement. Ken Greenberg, Greenberg Consultants Inc.; Mark Guslits, Mark Guslits & Associates Inc. & Artscape; John Gladki, Gladki Planning Associates; and Kelly Skeith, TCHC, provided their experiences of executing on the social development plan that sought to revitalize Regent Park. While it was clear that a large emphasis was placed on community and the public realm, this was even further reinforced with the partnership with The Daniels Corporation. Daniels Spectrum, the first new build in the community, is the arts and cultural centre that was integral to the revitalization. Jermyn Creed, Daniels Spectrum Hub Manager, discussed the programming and functional initiatives from the arts and cultural centrebefore bringing the group to the Centre for Social Innovation (CSI) space. LoriAnn Girvan, Artscape; Tonya Surman, CSI; and Denise Soueidan-O’Leary, CSI, hosted a panel discussion in the CSI space that fosters social entrepreneurship through shared work spaces. As a service agency, CSI seeks to cultivate partnerships and connections through social collision. “This is a community process, not a gentrification process,” the CSI team noted when discussing the perception of revitalization in the community. Regent Park has proven itself to be socio-economically diverse and inclusive, transforming itself to a vibrant mixed-use neighbourhood that warrants global attention. Daniels Spectrum and the Regent Park Aquatic Centre have drawn visitors from beyond Regent Park, shifting away from the previous stigma of the neighbourhood. It is not without its challenges: as the economic status of the neighbourhood improves, it is important to ensure that the accessibility of services and affordability is sustained. The iconic St. Lawrence Market was presented by Scott Barrett, City of Toronto. Barrett introduced the redevelopment of portions of the St. Lawrence Market and discussed the importance of the St. Lawrence Market on heritage considerations, community cohesion, food security, and food safety. Supporting this discussion was Paul Moyer, Merchant in Vineland Ontario, who brought the perspective from a farmer, local grower, and merchant at the St. Lawrence Market. Fran Freeman and John Coffman from the Urban Toronto Beekeepers’ Association brought an interesting outlook on beekeeping. Showcasing various examples, Freeman and Coffman educated the group on enhancing corridors or underutilized spaces as pollinating corridors. It serves the double benefit of providing park and open space for the community and benefits the bees. 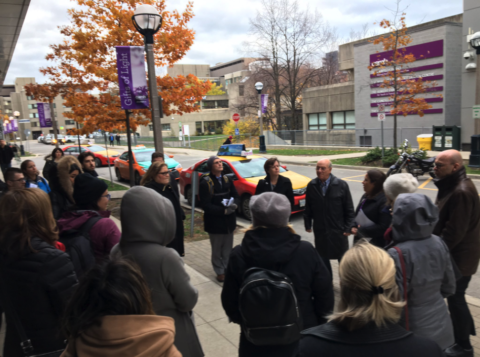 A tour on health in Toronto would not be complete without a visit to the Centre for Addiction and Mental Health (CAMH). It has been undergoing a multi-phased redevelopment at the Queen Street campus that is focused on breaking down the stigma associated with mental health and community integration. Frank Lewinberg, Urban Strategies, was one of the original planners of CAMH and discussed the community outreach program that was undertaken to inform the design guidelines of the master plan. Lori Spadorcia, CAMH, shared additional programming and initiatives, which involved the redevelopment of CAMH and its ability to promote advocacy of its vision of “Mental Health is Health.” Buildings are a physical representation that can inspire advocacy in normalizing the space and minimizing isolation barriers. and restaurant environment of Parkdale and the observed implications from economic forces felt across the city. The bus tour concluded with a drive through the residential neighbourhood. Where some existing housing product are being converted to single-family homes, this limits the supply within the community. In situations where there is rezoning for multi-residential development, the housing product is not affordable, thus limiting solutions for affordable housing in the community. With the loss of affordable housing, small business, and community space, the health and wellbeing of Parkdale residents is significantly impacted. 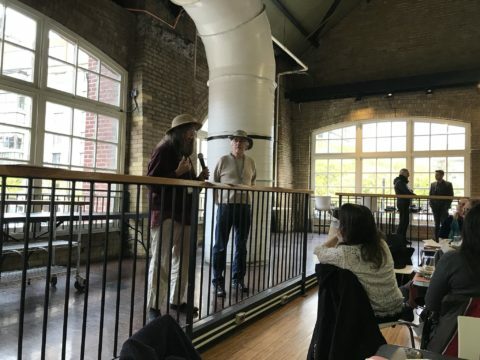 Loretta Ryan, Association of Local Public Health Agencies (alPHa), and Charles Gardner, Medical Officer of Health, Simcoe Muskoka District, gave a brief presentation that cultivated the key theme of the ULI 2018 Symposium city tour. There is significant potential for the built asset to support public health. A healthy lifestyle cannot fully be achieved without the community being conducive to it. Healthy design involves squares and plazas, more sidewalks, social spaces, trails and paths, community parks, open spaces, ravines, gardens, waterfronts, and public art installations. The idea of social spaces also enables people to meet social needs. If we want to define wealth in a way that goes simply financial wellbeing and includes social, health, and physical wellbeing, we need to continue the conversation on how we incorporate community design into the built environment.